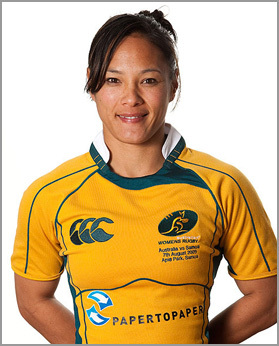 Former Australian women’s rugby 7s captain Cheryl Soon has joined the IRB’s Rugby Committee. Soon, who led the Wallaroos to the inaugural womens World Cup 7s title in Dubai after a dramatic sudden-death extra-time victory over New Zealand in 2009 and captained her nation to third at Womens Rugby World Cup 2010, also featured significantly in the IRBs successful Olympic bid in 2009. The scrum half replaces another figurehead of the womens game Carol Isherwood on the Rugby Committee as Isherwood moves on after three years steering key womens policies on the Committee. The IRB Rugby Committee is at the very heart of developing policies relating to the playing of the Game and comprising leading representatives from the playing, coaching and refereeing fraternities covering mens and womens Fifteens and Sevens. It recommends policy on critical areas of playing the Game such as player welfare, the Laws, playing trends and coaching techniques. IRB Chairman Bernard Lapasset said: Womens Rugby is going from strength to strength with over one million women and children playing the Game across every continent and the appointment of Soon, a highly experienced Sevens and Fifteens player, to the influential policy-recommending body underscores the IRBs ongoing commitment to the growth of Womens Rugby. The IRB Council believed that the addition of an experienced recent former international player to the Rugby Committee was necessary to ensure that the best interests of the Womens Game continue to be served on and off the field. There are few more experienced and passionate about the development of Womens Rugby than Cheryl Soon, who brought her passion to our successful bid to deliver Rugby Sevens inclusion in the Olympic Games. She is a winner and we are delighted that she has accepted the invitation and look forward to her invaluable contribution to the IRB Rugby Committee and the Game worldwide. I would like to thank Carol Isherwood for her exceptional service and contribution to the Committee. It should not be underestimated that her tenure came at a time when participation has boomed, competitiveness significantly increased, a Womens Plan implemented and an IRB Womens Sevens Series introduced. She will be a hard act to follow. Soon, who presented to the International Olympic Committee as Rugby Sevens was emphatically voted into the Olympic Games programme, said that she was looking forward to channelling her experience and passion for the Game into assisting the ongoing development of Rugby worldwide. Soon said: I am honoured and excited to be joining this influential Committee and would like to thank the IRB Council for the invitation and the ARU for their endorsement and support of my appointment. The IRB has done an exceptional job of growing the profile, reach and competitiveness of Womens Rugby. With two Olympic Games, Rugby World Cup Sevens 2013 and the inaugural IRB Womens Sevens Series on the horizon these are exceptionally exciting times for the Womens Game. I am looking forward to contributing fully to the IRB Rugby Committee to ensure that Womens Rugby remains a central consideration when discussing all aspects of playing and growing the Game. Mourie added: The appointment of Cheryl Soon alongside the likes of Fabien Pelous and Graham Henry reaffirms the IRBs commitment to ensuring that the playing and coaching fraternity contribute to the development of policies that relate to key areas such as playing, officiating, coaching, the Laws and player welfare. The IRB Rugby Committee comprises IRB Council Members Graham Mourie (New Zealand, Chairman), Bill Beaumont (England), Giancarlo Dondi (Italy), Michael Hawker (Australia), John Jeffrey (Scotland), David Pickering (Wales), Agustin Pichot (Argentina), Koji Tokumasu (Japan), Pat Whelan (Ireland) and Raul Martins (FIRA-AER), former players Fabien Pelous (France) and Cheryl Soon (Australia) along with RWC 2011 winning coach Sir Graham Henry (New Zealand). The IRB Rugby Committee is one of three IRB Standings Committees. The other two are the Audit & Risk Committee and the Regulations Committee.